People say it is the most dangerous job in the world. The White Helmets are a group of volunteers. They have pulled thousands of Syrians from the building destroyed by government bombs. 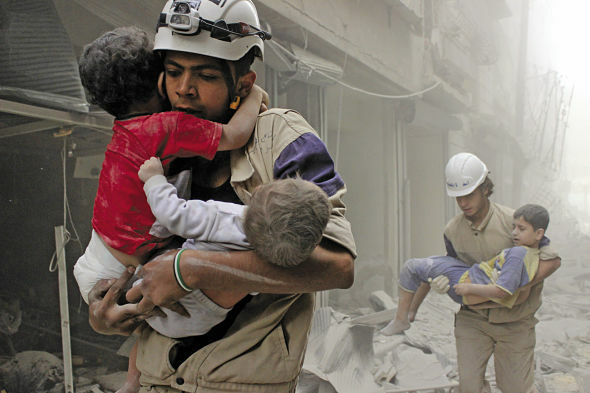 In February 2014, volunteers from White Helmets in Aleppo ran to help people after a bomb. They pulled a boy and his mother from the ruins of their three-storey apartment. Then they spent all night – 12 hours – trying to find her two-week-old baby. They took it out unharmed. That baby was the youngest of more than 22,000 people rescued over the past three years by the White Helmets. There are now 2,087 men and women volunteering for White Helmets in Syria. They tell people when bombs are coming, treat the people injured by bombs, fight fires, pick up body parts and bury the dead. But their first task is to get people out of homes, hospitals and schools after bomb attacks. Most of the bombs are ‘barrel bombs’ – oil drums full of a mix of explosives, old metal and sometimes chemicals, like chlorine – that the government drops on areas controlled by rebels. So far, 93 White Helmet volunteers have been killed. Often, after an attack, Assad’s helicopter pilots wait until relatives and rescue workers come – then they come back and drop a second bomb. 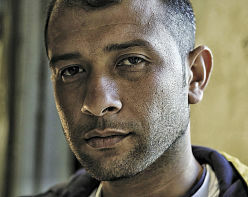 White Helmets leader Raed Saleh. Who are the White Helmets and how did it start? We are doctors, carpenters, students, everyone. Before the war, I sold electronics. The teams started all over Syria, helping people informally. We were all writing about it on our Facebook pages. So in September 2014, representatives of these local groups got together under one leader, with the same name and logo. When the Syrian army came into my town, Jisr al Shagour (in northwestern Syria), in June 2011, I escaped to Turkey with my family. For nine months I worked there in the refugee camps. Then I decided to come back – because Syria is my country. I helped start an emergency group in the Idlib region, and they chose me as leader. Our group was one of the first to get professional training in Turkey. Slowly we began setting up other groups. We trained teams to work across the whole Idlib area. The work is so important to us – helping people, saving lives. You can’t imagine how happy you feel when you save someone after many hours, and he is still alive. Is there one particular thing you remember? I’ll never forget the massacre in Darkoush (in northern Syria), at the Eid al Adha celebration two years ago. More than 130 people died, and more than 250 were injured. A lot of children were killed. But we couldn’t do anything because we just didn’t know how. We didn’t even have ambulances. I will never forget that day in all my life. Never. Never. Afterwards I had a breakdown and had to stay in hospital for a while. Then I decided I would never give up, that I would keep working with the White Helmets, so that there’ll never be another day when we cannot help the people dying in front of us. So many people have died and no-one has any idea when this will end. How do you keep working? Every day we save people, most of them children. This generation that we rescue are going to build a new Syria. When you see this child that you pulled out of the bombed building growing up in front of your eyes, you feel hopeful. You’ve given this child a new life, to build Syria again. Many White Helmets volunteers have been killed. Tell us about them. We’ve lost 92 men, and yesterday we lost another one in Zabadani, so 93 now. I had a good friend called Rageb Hamdoun. He died in Binish, killed by a second bomb dropped in the same place. And I have other good friends who have lost arms or legs and become blind. I have no words to describe those men, no words that can do them justice. What support do you want from the international community? The Syrian people do not trust the international community. 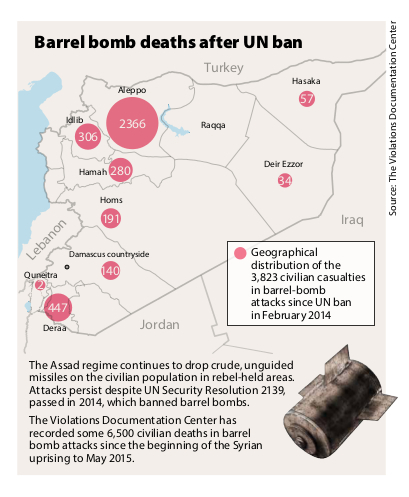 Last year, the UN agreed to stop the barrel bombing in Syria. But it is still going on. In March 2015 there was another agreement, that chlorine gas is a chemical weapon and Syria must not use it. But after this, chlorine gas was used. For two years the Syrian people have been asking the international community for a No-Fly Zone, but no-one listens. If these barrel bombs continue to fall on civilians, how are we going to build communities, how are we going to build services and infrastructure in the liberated areas? We need to finish off the first source of terrorism, Bashar al-Assad, and then the second source of terrorism, ISIS. I am certain that when we’ve got rid of Assad, the Syrian people will be able to get rid of ISIS. NOW READ THE ORIGINAL: http://newint.org/features/special/2015/09/01/rushing-towards-death/ (This article has been simplified so the words, text structure and quotes may have been changed). This page was last edited on 6 October 2015, at 22:03.